An information received with a photo, from Mauro Feltrinelli: "...2015: After some more works, Volpina V in a white new dress cruises on Lake Garda..."
"VOLPINA V", designed by Ing. G. Cesare Carcano in late 1967 beginning 1968 (?). "Volpina V" is the last boat of the famous series. Sail 29 mq displ. 2050 kg ballast 1160 kg. I attach sail plan and lines. About this boat Ing. Carcano said: The boat was born, built and tested with a little keel. As it was impossible to take all the lead ballast in one little keel, part of this was taken onto the hull's bottom. In this condition the boat's vertical stability was excessively reduced; with advantages sailing downwind, but taking a handicap upwind. It was decided to make one change and, after a tuning, the boat was fast. 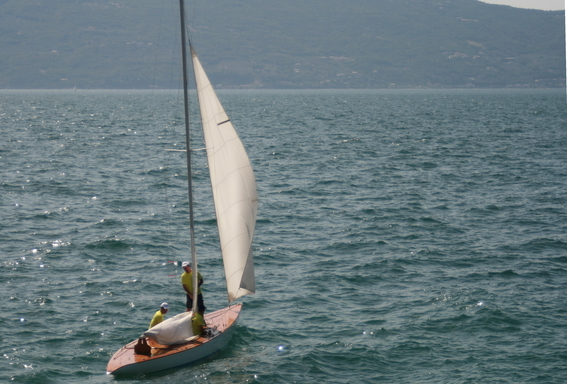 I know for sure the boat raced in Garda lake in may 1968 with other Volpina-boats and Ander, a design by Buizza. The performance of "Volpina V" was not excellent; the previous Volpina's were faster." "Volpina V is the last wooden 5.50 built in Italy, it's sail number is ITA-056, it was designed in 1968 by Giulio Cesare Carcano for Zeno Peretti Colò, built at Cantiere Molinari (Como) and refitted in 2008 at Cantiere Feltrinelli in Gargnano (Garda Lake)."